Hi guys! With the new semester starting soon, Operation Orion has begun its various campaigns and fundraising activities! 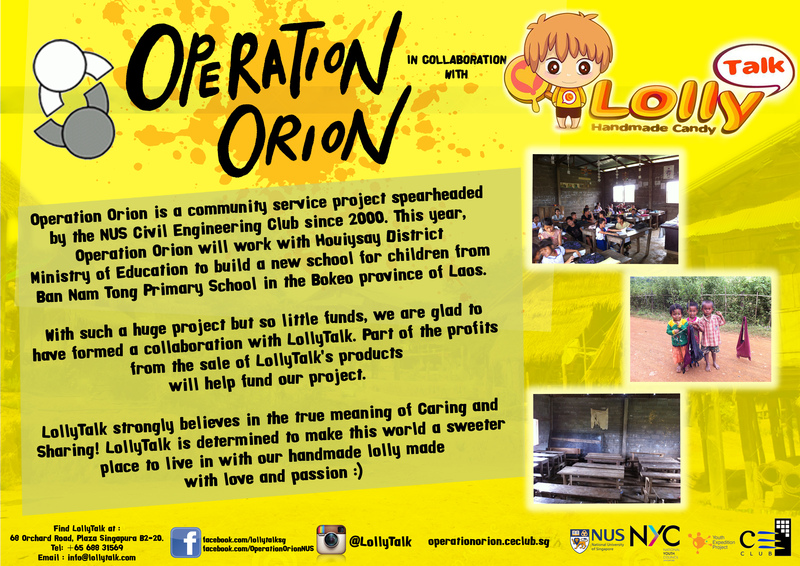 This year, Orion has the honor of liaising with LollyTalk (a homegrown candy maker trained in Australia who makes their rock candies fresh with love and passion) for our fundraising activities. To start the semester with a bang, we are going to participate in the Food and Electronics Bazaar 2013! Part of the profits earned at the bazaar will go into the funds helping the building of Ban Nam Tong Primary School in the Bokeo Province of Laos. With such a huge project ahead, we really need your support. So do come down, bring your friends along and have some sweets together!